It is now confirmed that a shipwreck found in waters off the coast of northeastern China's Liaoning province is that of a legendary cruiser – sunk during a battle in 1894 during the First Sino-Japanese War (1894-95). Chinese armoured cruiser Jingyuan (King Yuan), 1885-1894. Built in 1887 in Germany with many cutting-edge technologies it was considered a state-of-the-art warship. On arrival in China in 1888, Jingyuan and sister ship Laiyuan were both assigned to the Beiyang Fleet. In the summer of 1889, both vessels were part of the flotilla let by Admiral Ding Ruchang, calling on the Russian naval base of Vladivostok. In early 1894, both vessels accompanied Dingyuan and Zhenyuan on a visit to Singapore, but the flotilla was recalled to Weihaiwei on the eve of the First Sino-Japanese War with the Empire of Japan. Early in the Battle of the Yalu River on 17 September 1894, the captain of Laiyuan moved aggressively against the Japanese squadron, pursuing and severely damaging the slower moving Japanese gunboat Akagi, but receiving considerable damage in return, which set her on fire and removed her from the combat. With Laiyuan apparently doomed, the Japanese flying squadron led by Admiral Tsuboi Kozo (Yoshino, Takachiho, Akitsushima, and Naniwa), concentrated fire on Jingyuan for over an hour. Briefly, Jingyuan appeared to be closing on Yoshino in an apparent attempt to ram, but at 16:48, lurched to the starboard and burst into flames. Soon after, with a large explosion, Jingyuan rolled over and sank. Of the 270 crewmen, only seven escaped. 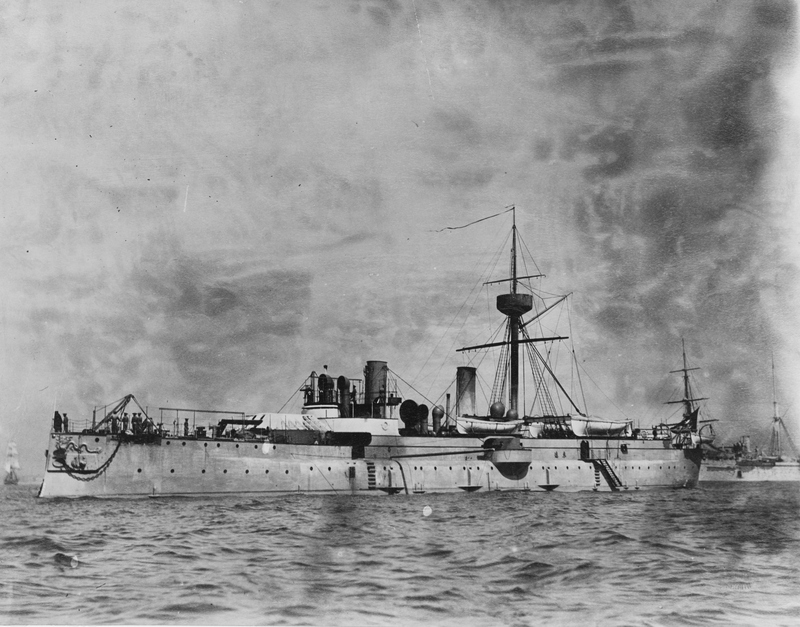 The Jingyuan was sunk with three other warships during the first China-Japanese War in September 1894. When it was built by German shipmakers in 1887, it was considered a state-of-the-art warship. The armoured cruiser was 82 metres long and had a displacement of 2900 tonnes. The discovery is of great significance for the research of China’s modern history, development of the Chinese Navy, and provides valuable materials for research of world warship history. On Friday, the China's National Cultural Heritage Administration said research carried out since July had confirmed the ship lies only 12m below the sea's surface near the Dalian coast. After careful sand excavation, divers went ahead with an inspection of its interior. The discovery of key evidence earlier this month proved to be a breakthrough in their attempts to identify the vessel. On Sept 15, researchers found the most important piece of evidence; Two gold-gilded wooden characters from a plaque hanging on the side of the ship. They matched the plaque shown in old photographs of the vessel. Two Chinese characters “jing” and “yuan” were found on a plate of the vessel, allowing the team to confirm that it was the wreck of the Jingyuan. "We were running against the clock to identify the wreck because the anniversary of the Battle of the Yalu River was approaching," said Jiang Bo, an archaeologist at the National Center of Underwater Cultural Heritage who led the research. He said historical files, witness accounts and an old photograph taken by a Japanese sailor before the Jingyuan sank were used to identify the location of the wreck. Jiang told China Daily the wreck has been well preserved because it turned upside down when it reached the seabed, leaving most of its upper deck buried in sand. Additionally, the team salvaged over 500 items from the wreck over the last two months, including parts of the warship’s structure, weaponry equipment as well as some tools. "Many windows even remain unbroken," he said. "It's like a time capsule sealing history inside." Blueprints from Germany were used as a reference for the studies, but Jiang said some of the ship's features were not included in the original designs, indicating that adjustments were made to prepare the ship for battle.